Pests are one of the biggest drawbacks to Natural/Organic farming in most people's way of thinking. Healthy soil practices usually diminish the problem and keep things manageable, but some years. . . YEESH! I am so happy to have Kristi from Stone Family Farmstead as our guest! She has some practical, real and useful information and tips! Taking care of a garden, regardless of size, can be daunting when you are dealing with an overpopulation of pests. Aphids are one of the worst because of how rapid they multiply in your garden. If you are an organic gardener, you will want to know how to get rid of aphids naturally and organically. But before I get to the remedies for aphids, let me share a few things that can be helpful for keeping all pests at bay. Using these tips will train your eye on what to look for, and you will learn when something looks “off” with your plants, which would allow you to head any pest or disease issues off at the pass. Make an appearance in your garden every day, preferably early in the morning. Taking a walk around your garden in the cool of the morning to harvest and look for chewed up leaves, eggs and larvae on the back of leaves, droppings, or any other indicators that something else is enjoying your bounty before you get to is a habit that will pay dividends. Keep your plants pruned back as much as is healthy for them. This will aid you in quickly assessing your plants for any stripped branches, droppings, pests on the backs of the leaves, etc. Make sure not to prune them back too much, though, or your fruit can suffer sunscald. All plants and gardens have some kind of bugs on and in them, and that’s ok. Some pests on our plants will not multiply as rapidly as others, and so it’s fine just to remove them by hand. Others, not so much. If you find a few aphids on insects on your plants, let that be a warning for you to start examining your plants briefly every day so the bug population doesn’t get out of control. Aphids attack a wide array of plants. They can be many different colors, but they all look and behave the same. Aphids carry diseases from plant to plant and are sometimes accompanied by a large colony of ants. They collect on the undersides of leaves, at the base, on stems, or in darker crevices of plants. They are rarely alone, but usually in large clusters on squash, tomato, roses, or many other types of plant leaves. Examine the undersides of your leaves to find colonies of these little guys. If you find them, you have a few choices on how to deal with them. Another way to get rid of aphids that is also effective is a warm soap and water solution (1Tb dish soap to a small bucket or 32 oz spray bottle of warm water, add essential oils if you prefer). Spray or sponge solution onto plants and leaves daily until the infestation is gone. Peppermint Neem Oil Recipe - To a ½ gallon of water, add .5-1 tsp. 100% organic neem oil (2 capfuls), 10 drops of peppermint essential oil, and a squirt of dish soap. To use, spray on the aphids, soaking the leaves where the bugs are. Repeat daily for a few weeks, or until the infestation is gone. Learning how to get rid of aphids naturally is easy, but it takes some consistency. Once you see the infestation subside, your plants no longer need to be treated with pesticide, DE, or soap treatments until you see indications of another infestation. Do so for very long poses the risk of killing off the population of beneficial predator insects, which would make it easier for the next infestation to take hold. For further information about aphids, check out UC Agriculture and Natural Resources’ page on the topic. of other pests in the garden? By signing up and receiving this awesome cheat sheet you will be included in BOTH Beanpost Farmstead's AND Stone Family Farmstead's community all in one fell swoop! You will get emails with tips, updates, free products and much, much, more! Download Kristi's Natural and Organic Pest Control Cheat Sheet today! Kristi Stone is a student of all things modern homesteading and is living the dream on her 1-acre hobby farm. Her favorite things to do include growing and preserving food for her family, breeding and raising Nigerian Dwarf goats, studying and using herbs, and running her hobby farm in sunny Southern California. 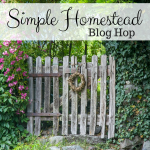 Kristi writes about all of these topics and more on her blog, Stone Family Farmstead. I know you'll want to read more from Kristi! I’ve been fortunate not to have a huge problem with aphids…yet! I have a lot of wild areas around, and I think it gives the beneficial insects an area for overwintering and breeding. Thanks for the great tips! I will be back again if the aphids take over this summer!